Woodruff is a common plant of the forest floor in European temperate deciduous forests with mouldy soil and not too much shadow. It forms dense stands as it propagates vegetatively by suckers. 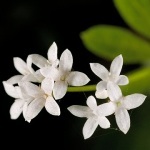 Woodruff often makes itself conspicuous with a sweet scent of coumarin in the air. 2H-1-benzopyran-2-one) is liberated by enzymatic cleavage. A pressed specimen of woodruff in a herbarium smells of coumarin for years. Coumarin (and substituted coumarins) are secondary metabolites produced by many plants (see also lavender, lime fruit, sweetclover, tonka beans) where they act as insect repellents . Pure coumarin is a colourless, crystalline compound with a diffusively sweet, herbaceous-warm, somewhat spicy odor. In extreme dilution it smells more hay-like, nut-like or tobacco-like. It is easily prepared by organic synthesis and is extensively used in perfumery to support herbaceous odors, especially in the so-called fougère (fern) types. Coumarin was formerly used in aromas where it acts as a synergist to vanillin. However, this use i prohibited today because of coumarin's liver-damaging effects when ingested. Nevertheless, small amounts of coumarin are allowed in certain beverages, e.g. the German 'Maiwein', which is white wine spiced with woodruff (Waldmeister in German). 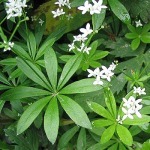 Dried woodruff contains about 0.25 % coumarin . Etymology: The name of the genus is from the ancient Greek name galion (gala = milk) for the closely related species Lady's Bedstraw, Galium verum, which was said to be able to function as a rennet. Lat. odoratum, fragrant. 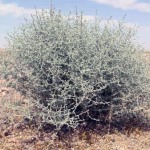 Most of the more than 250 species of Artemisia are dry-land inhabitants playing an important role in the desert-like vegetation in Central Europe, North Africa and Asia. The so-called artemisia oil, or armoise oil, is obtained by steam distillation of white wormwood, a dwarf shrub growing wild in various areas of North Africa and the Middle East. White wormwood exists as various chemotypes and the composition of the oil may vary widely. Moroccan oil (Marrakesh-type) has a light herbaceous odour characteristic of thujone . The oil also contains a number of irregular monoterpene alcohols, e.g. 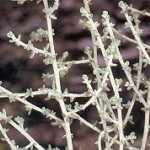 artemisia alcohol , and the anthelmintic sesquiterpene lactone alpha-santonin has been isolated from the flowering branches . Artemisia oil is used in fairly large amounts in fine perfumery, e.g. 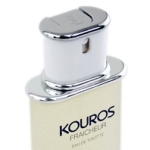 for Chypre notes, one great example being Kouros Fraicheur (Yves Saint Laurent 1993). Etymology: Gr. Artemis, the goddess of hunting and the moon. The wormwoods have their name from their ancient use as a remedy against intestinal worms. The alcoholic drink vermouth (~ wormwood) is made from white wine and spicy herbs, among them Artemisia absinthium. This member of the Apocyanaceae or the dogbane-family (also including, for instance, the genera Trachelospermum, Plumeria and Vinca) is from Peru and other parts of tropical America. Being a close relative to Nerium (Nerium oleander) it is a bush of 4 to 8 m's height with a somewhat lighter green color and yellow (sometimes orange) trumpet-shaped flowers. 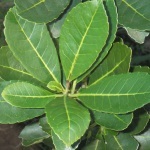 All parts of the plant have a poisonous milky sap containing cardiac glycosides of the cardenolide type that cause vomiting, dizziness, and cardiac dysrhythmias . 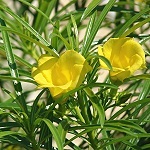 Yellow oleander is widely cultivated throughout the tropics and subtropics as an ornamental. In the Canary Islands, Gran Canaria for example, it is planted in the tourist areas. The above photo of seeds and a flower is from there. The flowers' mild sweet fragrance is strikingly resembling the aroma of certain pastilles (lozenges). This corresponds well with the finding that their main volatiles are 1,8-cineole (eucalyptol) and beta-ionone . 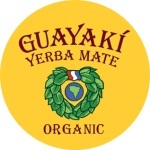 For millions of South Americans, yerba mate tea plays an equally important role as a ritual and stimulant drink as (Chinese) tea and (Arabian) coffee in the rest of the world, and yerba mate is gaining rapid introduction into the world market. Ilex paraguariensis is a medium-sized evergreen tree of the holly family (Aquifoliaceae). It is indigenous to Paraguay, Brazil, Argentina and Uruguay and is widely cultivated in these countries. However, to supply the growing world demand it is now cultured in many tropical countries. 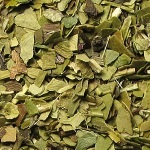 Like green tea, yerba mate leaves go through a blanching process to deactivate enzymes, followed by drying and ageing. 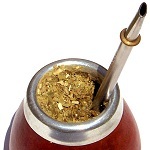 The finished yerba mate product has a rich green-herbal hay-tobacco-like aroma. Traditionally, a warm watery infusion of the comminuted leaves (often including stems as well) is drunk out of a dried gourd using a metal straw called a "bombilla" (with a filter attached to the lower end to strain out leaf fragments). The tasty and slightly bitter brew has a high antioxidant capacity and contains numerous bioactive phytochemicals. The stimulant effect is primarily attributable to the purine alkaloids caffeine (1-2% of dry weight) and theobromine (0.3-0.9% of dry weight). The amount of caffeine consumed pr. cup of yerba mate tea is similar to the amount of caffeine in a cup of coffee . 2-methoxyphenol (or guaiacol, smoky note), eugenol (spicy note), (E,Z)-2,6-nonadienal (strong green note), and 2-acetyl-1-pyrroline (popcorn-like note; this compound is also known from cooked basmati rice, for example, and has a very low odor threshold) . Etymology: Lat. Ilex, as the leaves of Holly have a resemblance with those of the Holm Oak, Quercus ilex; Lat. 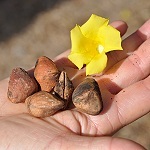 paraguariensis, from Paraguay; Quechua, mati, cup; Spanish, yerba, herb. The ylang-ylang tree is planted everywhere in the tropics because of its fragrant flowers. In the Philippines, for example, the tree is seen in almost every village. The peculiar flowers are green when they come out, but in a few days they turn yellow and become highly fragrant. On special occasions the women put them in their hair. Ylang-ylang oil is obtained by steam distillation of the freshly picked flowers, especially in Madagascar and the Comores. It is a pale yellow oil with a very powerful, floral and intensely sweet odour and a cresylic and benzoate-like top note of limited tenacity. The fadeout is more pleasant, soft and sweet, slightly spicy and balsamic-floral. 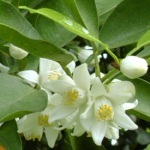 It is a classical ingredient in perfumery, used for example in Chanel No. 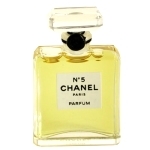 5 (Chanel 1921), and in countless other perfumes. p-cresyl methyl ether (ca. 20 %), methyl benzoate (ca. 5 %), methyl salicylate and cinnamyl acetate. Although only precent in traces, p-cresol, eugenol and isoeugenol are also odour determining, as well as benzyl salicylate (ca. 3 %). Moreover, the oil contains a high percentage of (-)-linalool (ca. 15 %), geranyl acetate (ca. 10 %) and farnesyl acetate (ca. 3 %), as well as a number of other sesquiterpenes and their oxygenated derivatives, e.g. muurolol T (ca. 2 %)  . 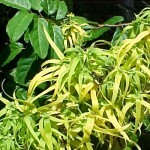 p-Cresyl methyl ether is a characteristic of the ylang-ylang flower. The pure compound has a very powerful odour, offensive to most people. However, in lower concentration, and supplemented by the multitude of other odorants present in the flower, it supplies much of the exotic character of ylang-ylang. 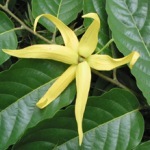 A delightful ylang-ylang absolute is made by extraction of the flowers. It has an intesely sweet-floral and very diffusive odour with a typical balsamic floral note, and is distinguished from the odour of the oil by its lightness and uniformity - according to Arctander. It is one of the finest floral materials in high-class muguet perfumes (lily-of-the-valley). 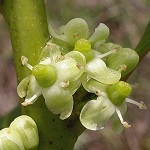 The genus Cananga holds only four species, all with fragrant flowers. The rest of the Annonacean family usually has flowers with a moldy or putrid smell, if they have any smell at all. Etymology: ylang-ylang, or ilang-ilang, is Indonesian, meaning 'loosely hanging' (flowers). 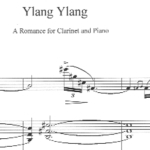 And since you have arrived at the end of this monograph, you may now listen to a few bars of the Australian composer John Spence's "Ylang Ylang" (2005) - a romance for clarinet and piano. Citrus junos is native to China but mainly cultivated in Japan where it is known as yuzu. The fruit looks like a bulgy tangerine and the leaf is interestingly compound, the larger leaflet being connected to the stem by a smaller one. Yuzu fruits are normally harvested in autumn while still green, although the fruits eventually turn into an orange yellow colour. Their aroma is clearly different from those of other citrus fruits - a characteristic tart, dry aroma reminiscent of green grapefruit with definite overtones of mandarin orange. Yuzu is rarely eaten as a fruit, since the flesh is acidic, bitter and seedy, but it's juice and peel is an integral part of Japanese cuisine. Moreover, bathing with yuzu on Toji (winter solstice) is a popular custom. 6-methyloctanal, 8-methylnonanal and 8-methyldecanal, which had not been previously reported to occur in nature. Their properties were confirmed by synthesis and their contribution to the fresh green, bitter citrus, and sweet notes of yuzu peel oil was verified . Sakai et al., in their search of characteristic yuzu odorants, identified (Z)-9-dodecen-12-olide, now called yuzu lactone, in cold pressed yuzu peel oil . Rodefeld and Tochtermann later synthesized this lactone and found it to possess "a very complex and intensive odour that can be described as earthy, dry and dusty, woody, fresh and camphoraceous-minty with a fruity under-tone and some wax-stearin-like accents." 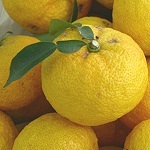 However, it's contribution to the typical yuzu flavour was considered to be of minor importance . Song et al. found that 6-methyl-5-hepten-2-ol and dimethyl trisulfide had the highest flavour dilution (FD) factors among the identified components of yuzu peel oil . Yuzu peel oil is used as a refreshing ingredient in perfumes and cosmetics, for example in L'eau Par Kenzo Pour Homme (Kenzo 1996), a hesperidic-aquatic fragrance created by Olivier Cresp (Firmenich).